Robin Rive bears are all born at Oakdale Farm, New Zealand ﻿. ﻿﻿Dubois is a smart looking fellow who is dressed with a blue and green tartan ribbon around his neck.
. has leather medallion around his neck with word "Dubois" on it.
. jointed at neck, arms and legs. 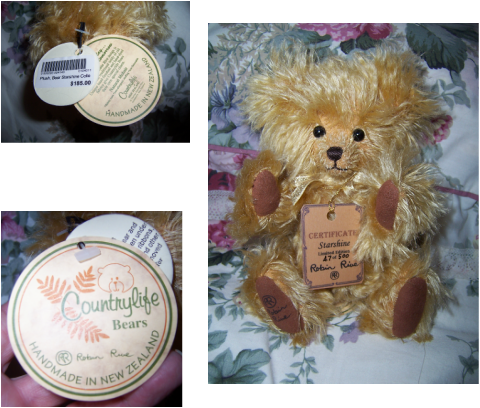 "Country Life" in New Zealand sell Robin Rive's bears for well over NZ$600. 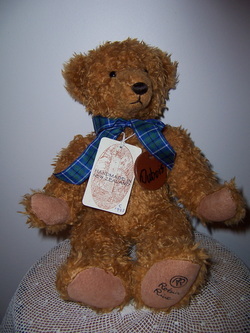 Fred Bear is a cute looking teddy who has a brown satin ribbon with a leather medallion around his neck.
. has leather medallion around his neck with word "FredBear" on it. "Country Life" in New Zealand sell Robin Rive's bears for this size for well over NZ$300. 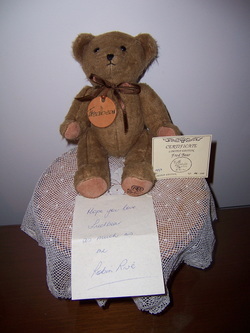 18CM TALLWe have for sale a miniature Limited Edition teddy bear made by the famous New Zealand bear maker - Robin Rive. All in all a cute little bear.